Sobering, unsettling, and at times startling climate change-related news emerged this past week around the world. Tourists in Iceland ran for their lives as the wall of a glacier they had come to see collapsed and dropped into a bay propagating a huge wave that traveled quickly towards the rocky shore where they were standing. Scientists conducting a long-term study in Shark Bay, Australia find that dolphins’ reproductive capacity diminishes and they’re having fewer young because of heat waves and warming ocean waters. Part of Antarctica’s Brunt Ice Shelf reportedly about twice the size of New York City is about to break off, or calve, creating a giant iceberg. Canada’s climate is warming about twice as fast as the rest of the world on average and it is having effects across the economy, society, and the environment. Fortunately for a group of tourists, an expert guide was accompanying them when they visited Iceland’s Breidamerkurjokull glacier recently. A huge chunk of the glacier’s wall broke off and dropped into the sea as they were watching, creating a series of huge waves that rapidly moved to the shoreline where they were standing. No one was injured. Air and water temperatures are rising much faster at high latitudes on average than they are at lower ones and Iceland’s 269 named glaciers are thinning and disappearing. 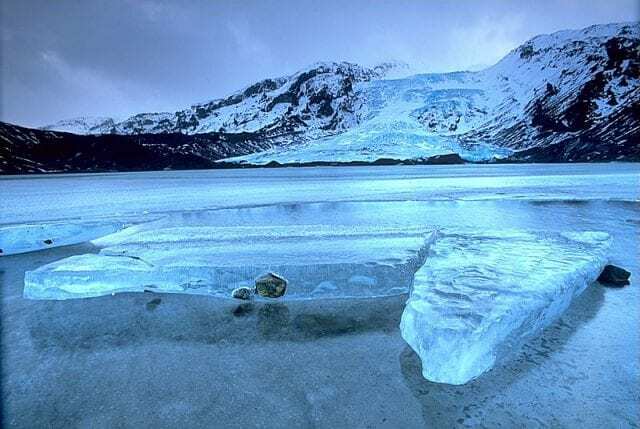 Iceland’s Okjokull glacier shrunk to the point where it has been considered dead ice — it isn’t moving or creating new ice — since 2014, but it wasn’t the first, according to a post from The Reykjavik Grapevine. Rapid ice thinning of Iceland’s glaciers became near universal in the mid-1990s, the report highlights. “An overwhelming majority of Iceland’s glaciers are decreasing in volume almost every year,” the report says. Dolphins in Australia’s Shark Bay are giving birth to fewer young over at least a 10-year period, from 2007 to 2017, according to research scientists conducting the long-term study. The researchers discovered the persistence of low birth rates and other anomalous reproductive developments by chance after noticing that Shark Bay dolphins were giving birth to fewer young after a heat wave struck in 2011. The water temperature in Shark Bay rose about 4 degrees Celsius (~39 degrees F) above the annual average and the survival rate for some species of dolphin dropped 12 percent, according to the study. The dolphins also gave birth to fewer calves. The scientists haven’t pinpointed the cause or causes of the dolphins’ survival and birth rates. They noticed that warming waters have killed off seagrass in Shark Bay, which provides habitat and a source of food and nutrition for many and varied marine species, including those that the dolphins rely on, however. “Once we realized that the 2011 warm water event had such devastating consequences on the seagrass beds in Shark Bay, we wondered whether [animals] on top of the food chain might also be affected,” study author and director of the Dept. of Anthropology at the University of Zurich Michael Krützen was quoted. A rift in Antarctica’s Brunt Ice Shelf has lengthened 200 meters (>650 ft) in the past month and it’s converging with another rift near to a research facility run by the British Antarctic Survey. The convergence of the two rifts is a sure sign of calving, the process by which part of an ice shelf separates from the main body of the ice sheet to create an iceberg, according to a news report. Calving is a natural process for ice shelves but a large and growing body of evidence indicates warming ocean temperatures are accelerating the process. More than 3.3 million tons of Antarctic ice has melted since 1992, according to a 2018 study, the news report points out. “There have been a number of published studies that show there are ice shelves that are thinning,” Christoper Shuman, a research scientist at the University of Maryland, Baltimore County’s Joint Center for Earth Systems Technology at NASA’s Goddard Flight Center, was quoted as saying. Average mean temperatures in Canada has risen an estimated 1.7 degrees Celsius (3°F) since 1948, twice as fast the global average, according to the latest climate report from the federal government. Temperatures in the Canadian Arctic have been rising the fastest and the effects of nationwide climate warming are probably irreversible and likely to intensify a news report highlights. Annual average temperatures have increased by some 2.3°C (~4.1°F) in northern Canada. Temperatures in Canada’s Prairies and northern British Columbia have also been experiencing increases in average mean annual temperatures higher than the national average. Both natural and human factors contribute to rising temperatures, but the human factor dominates, according to the study. “It’s likely that more than half the observed warming in Canada is due to the influence of human activities,” the report authors state. Canada’s federal government is taking steps to strengthen and expand its climate change policies and actions. It recently imposed carbon taxes on four Canadian provinces (out of 10) that haven’t introduced their own climate change action plans, the news report points out. An initial federal carbon tax of C$0.044 (US$0.036) per liter of fuel sold is being added to sales in Manitoba, New Brunswick, Manitoba, and Saskatchewan. The federal government will compensate households with rebates to offset the higher retail fuel costs, according to the news report.